While most tourists should find Japan a country with enough attractions to lose themselves in, one thing that will not be lost is their luggage. That is the conclusion of a Daily Telegraph article which cites a new report from Skytrax. 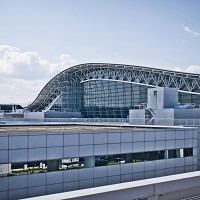 The UK-headquartered air transport consultancy found an impressive statistic to underline Kansai International Airport's efficiency. Since opening 21 years ago it has lost precisely no post-flight baggage items whatsoever. Kansai sets a difficult benchmark for its fellow Japanese airports to follow. But it is a challenge, the report suggests, that they are more than up for. Tokyo-based Haneda (sixth) and Narita (10th) also feature in the leading 10 airport baggage re-enters out of 550 locations reviewed across 112 countries. Of course, Japan sets a standard that other nations' airports often struggle to follow, with luggage around the globe lost at a worrying rate. That is why it is wise to take out travel insurance through a reputable firm - even if you are travelling to Japan. Such cover can include mislaid flight documents, replacement medication and missing bags. This futuristic-looking central Japanese structure was constructed on an artificial island in 1994. The Osaka Bay-based airport did not only score brilliantly for its faultless baggage record. In addition, it was praised for the quick time in which customers get their bags after leaving their flight. The scrupulousness of airport employees was also commended. Such attention to little details was emphasised by its practice of luggage handling workers putting suitcases upon carousels with the handles turned to face the travellers. This renders it far more simple for customers to pick up their baggage. Skytrax marketing director Peter Miller outlined in an interview with Telegraph Travel what the awards' judges were looking for. Quick, efficient employee support services and luggage delivery plus baggage hall data all featured prominently on their tick lists. The report drew from 13 million reviews across 20 categories. Skytrax used the data for its 2015 World Airport Awards.